A blog about untying knots, releasing lines, weighing anchor and getting under way again, after having lost the captain in my life. Through time my paintings have won several prizes and awards but for the first time in my life my writing has also received recognition. Firstly I was given an honorable mention in a writing contest organized by the international Sistership Magazine based in Australia. The contest was eligible for women only and the theme was Facing your fears. Not only was it a writing contest but Sistership also published a book called Facing Fear Head On. 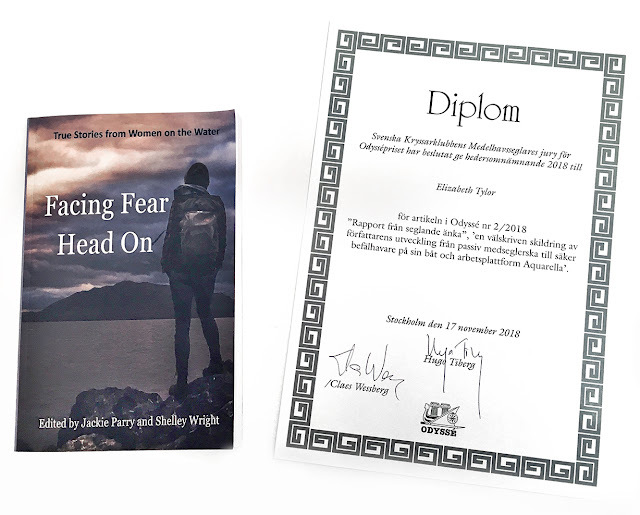 The book consists of an anthology of short stories about fear written by 46 women on the water, from all over the world. Then, in this months Odysse magazine there was yet another of my watercolours reproduced to illustrate an article about the recent "medicane" in Greece. 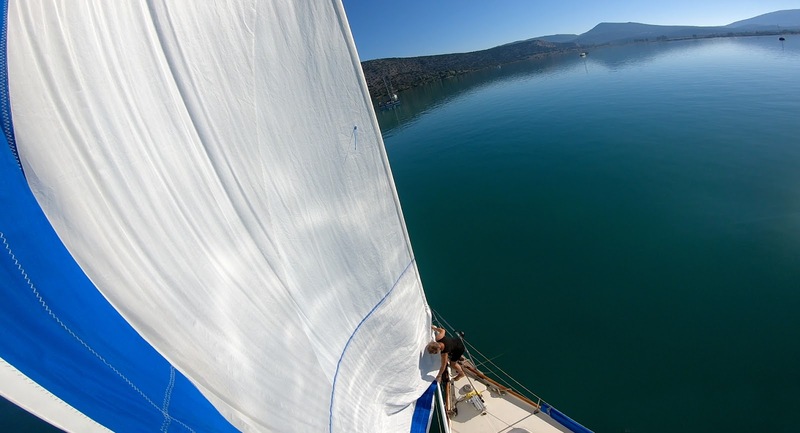 This post is more arty than boaty but I hope sailing enthusiasts might also like to see it. I know I have promised this several times but here it is, actually finished at last! This is the video I have been working on for months. 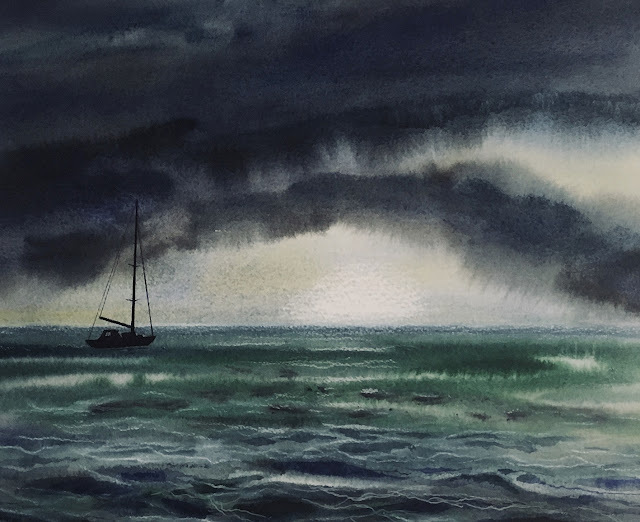 Now called Sailing Through Watercolours the 71 minute film closely follows my work as I paint four different watercolours. 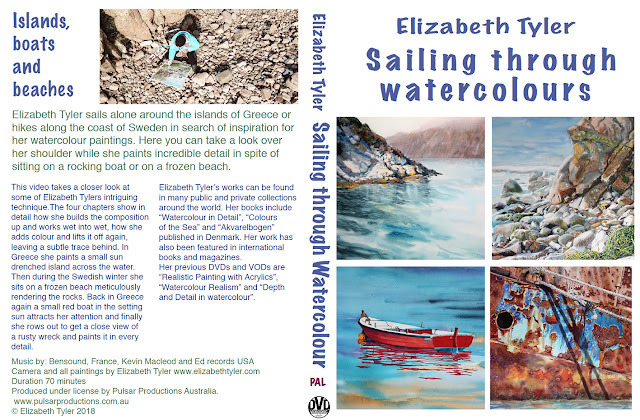 Three of the paintings were done in the heat of the summer on board my boat in Greece and one in the middle of winter on a frozen beach in Sweden. This is my fourth film produced for Pulsar Productions in Australia. They source the best art instruction DVDs and films from all over the world and it is a great honour to work with them. The full length video can be bought to watch online and download via Vimeo as VOD ( video on Demand) or as a DVD disc. 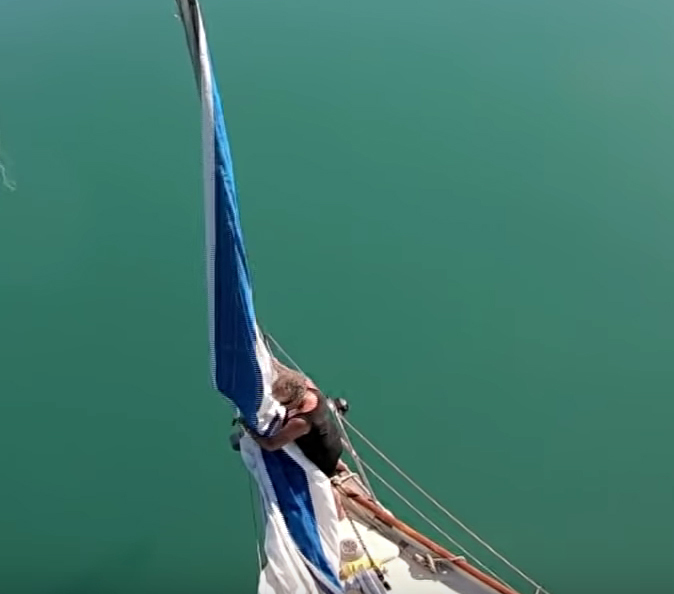 From the video "Sailing on Single Handed #5"
So here it is, finally. 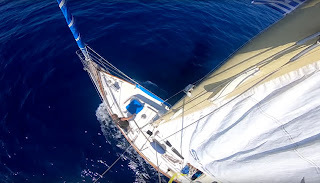 I have edited a new video with scenes from this summer's short sailing expeditions and some footage of the work I did during the hours, days and weeks of painting watercolours on board my boat Aquarella. This is all boiled down to a 4 minute video on YouTube but much of the remaining work involved is now edited and will shortly be released as a 70 minute art educational video on DVD and VOD. The working title is "Watercolour on the Water" but may be changed in the final stages of production. I will post on this blog when it is available. with a Manfrotto 492 micro ball head. to pull up the mast (and down again) for aerial footage. To steady it I pulled it tight under the spreader. My ipad could be used as monitor and remote control. I spent a lot of time this summer experimenting both with my drone and GoPro action-camera to get some aerial shots and videos. 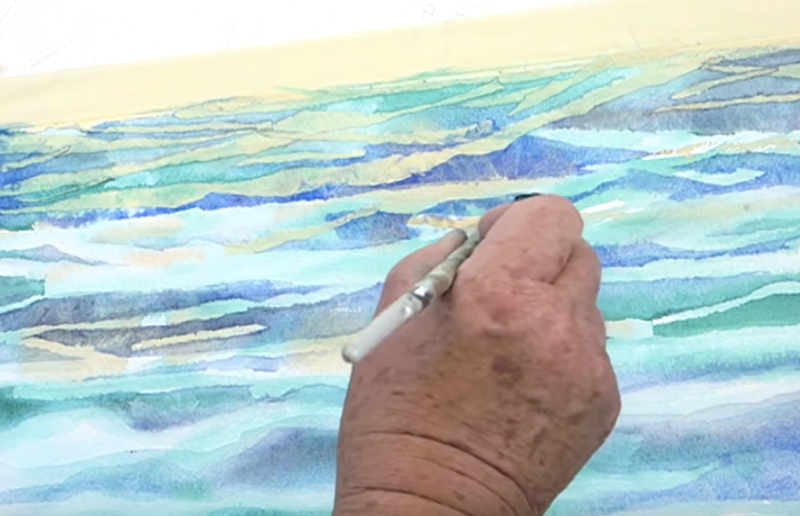 Some of the video footage will be included in my latest art educational video which will be released shortly. It's difficult to film situations in action when sailing alone but with some planning, a lot of practice and the right equipment it is possible. I realised I have to practise a lot more and there is always a certain degree of risk involved but I'm getting better at it. 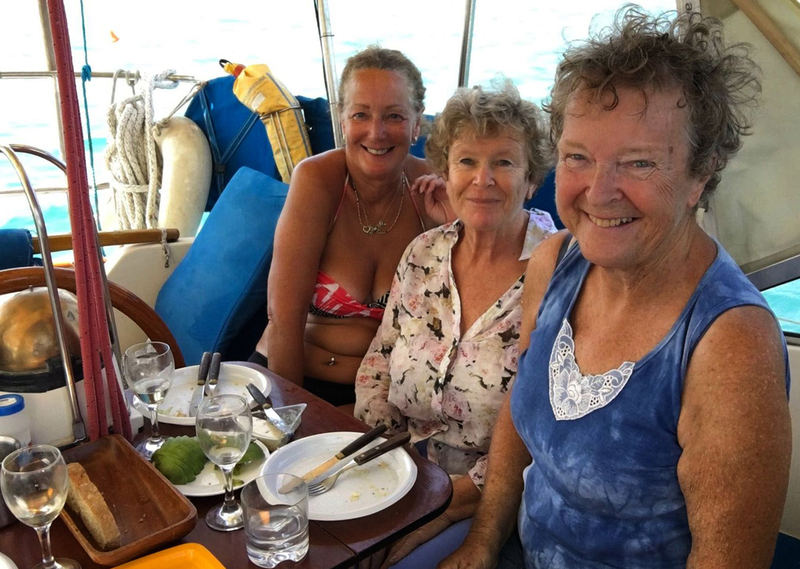 I also spent some very valuable time with friends, some of whom came aboard for a while when we discussed, laughed, giggled, ate lunch, drank wine and thoroughly enjoyed ourselves. 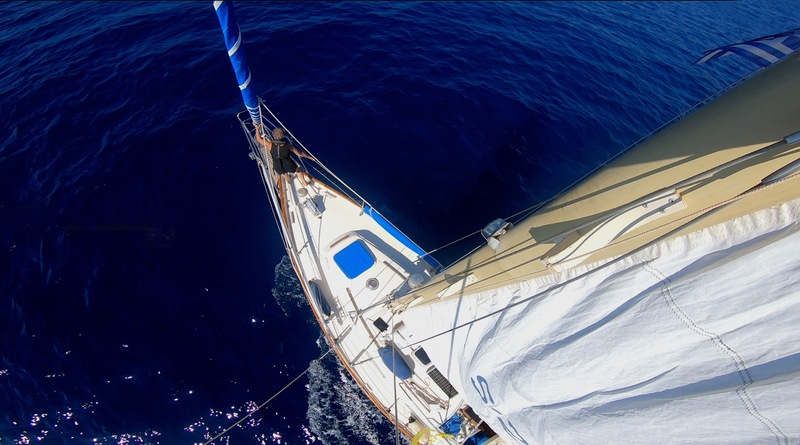 So, for a while my life wasn't just painting, sailing, writing and filming. I allowed myself time to enjoy and be inspired by others and hopefully give something in return. on their boat "Ruby" filmed from my drone. At the end of September there was a disturbing weather forecast of a very severe storm over most of Greece including the area I was in. I had to return to Kilada and the boatyard where I have Aquarella in winter so I decided to make a mad dash for it. Sailing alone it took me 10 hours to get there in moderate winds and I arrived in a dead calm. The following day I rang the boatyard and asked if I could be lifted out as soon as possible. I was put on stand by as 25 other boats had the same idea that day. The following morning they called me on the VHF that it was now Aquarellas turn. The wind was quite strong by then but when I arrived at the lifting dock six strong Greeks helped by holding, pushing and pulling my boat in position under the crane. An hour after getting on dry land all hell broke loose and the storm was over us. I'm so glad I made it ashore in time. The storm, also called medicaine Zorba lasted 5 days and although Aquarella was secured on a very well constructed cradle it still felt scary rocking and vibrating all day and night in the howling wind. 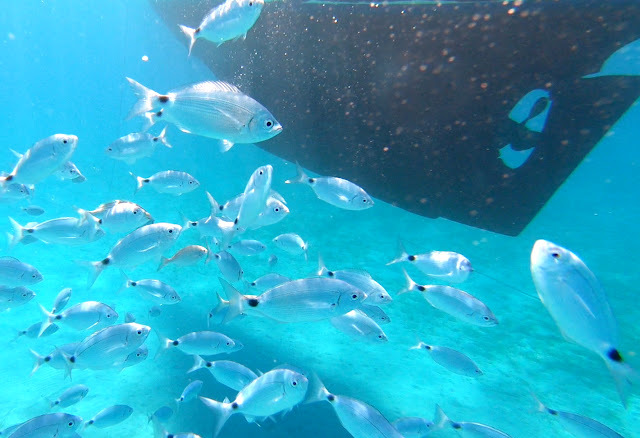 It was not safe to go out of the boat as parts from surrounding boats were flying through the air. In the torrential rain the boatyard was partially flooded by a fast flowing river of brown water. Aquarella will stay where it is now parked for the winter next to a farmyard with chickens, goats and pomegranate trees. The next door neighbour came over before I left and gave me a whole bag of delicious pomegranates. He then calmly went back to slaughter a goat and hang it up in one of the trees. 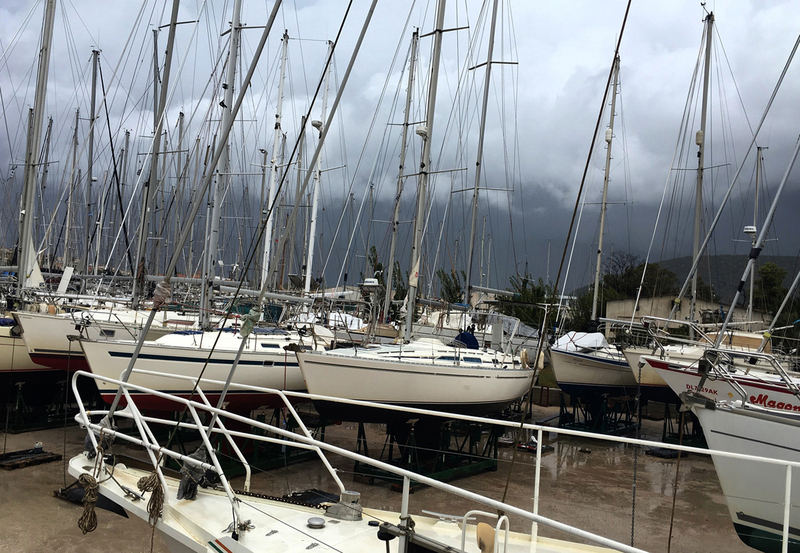 The Basimakopoulu boatyard during a lull in the storm. 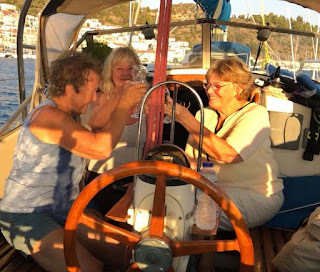 I had invited my Poros friends Catherine and Sarah for lunch on board Aquarella and we piled into my little dinghy to get across the 200 meters of water between my boat and the quayside. It was calm weather so I asked them if they would like a short sail across the bay before lunch. Sarah had not been on a boat before and Catherine was not used to it either but they bravely said that was a great idea. I thought I would show them the bay where the old shipwreck lies; the one I had been painting recently. Stopping about 150 meters from the wreck, I anchored in 10 meters of water and let 40 meters of chain out. Then we settled down for lunch. before everything went pear shaped. Sarah wanted a swim and the water looked inviting until she saw the enormous (OK, about plate size) jellyfish. Catherine kept a look out while Sarah climbed down when the coast was clear. Suddenly she was surrounded by them and she shot out of the water like a flying fish. We reckoned they then regrouped under the dinghy waiting for any of us to dare climbing down into the water again. So we didn’t. 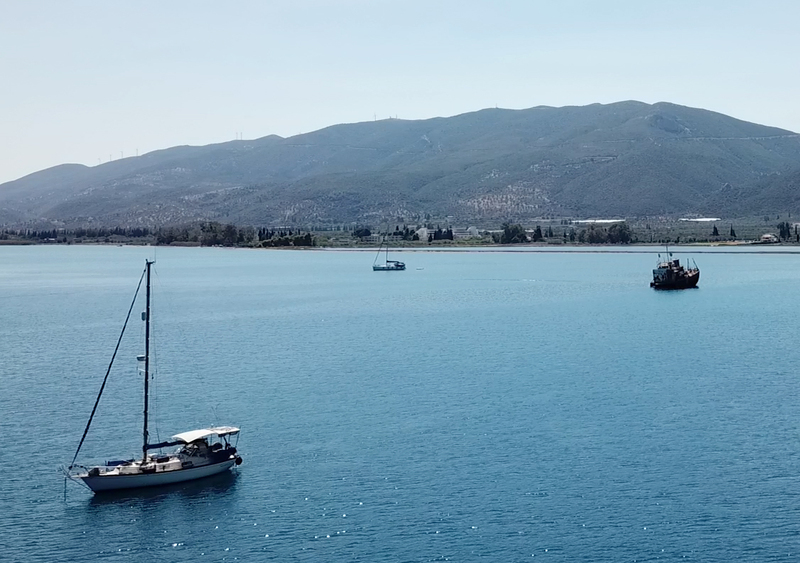 The wind was gradually increasing so I decided to return to the buoy in Poros. When the anchor was almost up I saw it had caught on something. It had fastened into a big and heavy ship’s ladder of rusty iron! I fetched my trusted slip-hook and line to hook onto the ladder and fasten it to a cleat on deck while I lowered the anchor to free it. However the following rung of the ladder prevented it from this. It was locked between the rungs. Aquarellas anchor firmly attached to an old ships ladder. I thought of taking my dinghy to get a line through the back of the anchor and try pulling it out the same way it came in but abandoned the idea as the sea was quite choppy by now and having no anchor down meant we were drifting fast towards shallow water. Catherine called out the depth to me every half meter: 9 meters, 8.5, 8, 7.5 and so on until it was 1.5 meters. Then I had to get back to the helm. It’s difficult to get hold of the buoy in any circumstances but even more so in any kind of wind. With Catherine and Sarah each brandishing a boat hook I thought we might succeed. Two hookers trying to pick up a buoy (excuse the pun!) However the wind was too strong and the ladder was in the way so even though Sarah had caught the buoy she couldn’t hold it long enough to secure it, it was wrenched from her hands and she had to let it go. I then asked the crew of a French boat nearby if they could help. The two men got down into their dinghy and came across. They had misunderstood in that I just wanted them to help us pick up the buoy but they started to try and unloosen the ladder. In the meantime we were drifting through the mooring field so I had to keep to the helm. They then understood it would be best to tie up to the buoy first. When we got near it the elderly gentleman in a life jacket who was still in their dinghy suddenly fell backwards into the sea! I thought he had had a heart attack and I was about to jump in to try and save him when I saw he was swimming with my mooring line. He attached it swiftly and swam back to Aquarella. The younger man was also in the water by now to try to attach a line to the bottom rung of the ladder but in spite of pulling and winching it didn’t budge. He borrowed snorkel and flippers to dive down while I slowly lowered the anchor and ladder. With the weight of the burden lifted off it was then possible to release the anchor from its locked position. We were so grateful to this wonderful father and son duo for their patience and perseverance in helping us out of this predicament. PS Sarah kissed the quay went I took them ashore in the dinghy. 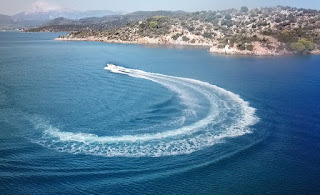 Ormos Vidhi is not far from the mooring buoy I hire in Poros, just an hour’s sail. I had wanted to go there for quite a while but the wind was too strong. There were two reasons for waiting for less wind. The first reason was that I wanted to send my drone up over the bay and my Mavic Pro drone is quite sensitive to a strong wind. 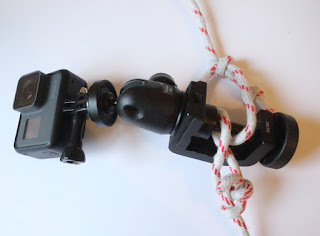 The second reason was that I also had to be able to pick up my mooring buoy when I came back and that is not easy to do alone in any sort of wind. The weather forecast looked good so I set off in the morning in no wind at all so I motor-sailed over to the bay. My object of interest was a shipwreck that has been lying there for years. I had painted a watercolour of it a few years ago and wanted to give it another try from another angle. The last time I had filmed the whole work in progress but only published a few minutes of this on YouTube. This time I wanted to show more of the work involved painting the watercolour and also get some areal footage of the whole scene. 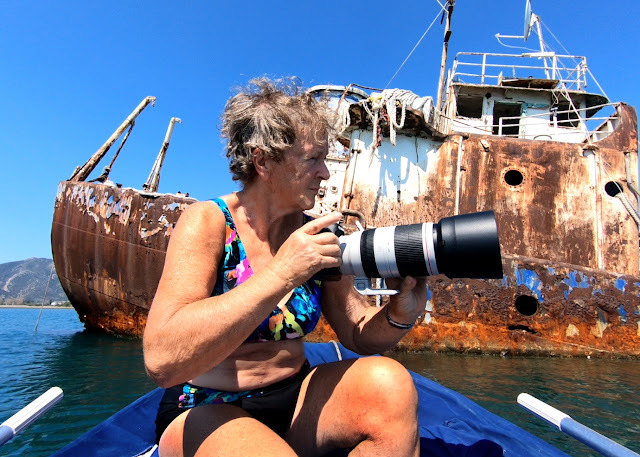 I dropped my anchor in 10 meters of water at a safe distance from the wreck. ( last time my anchor caught in one of the wrecks cables) From there I could take my dinghy over to take some close up reference photos. There was more rust on the hull than before and the original paint was almost gone but nevertheless the colours were beautiful. I filmed this little excursion with my GoPro action camera. It was either attached to the dinghy engine or on my head. 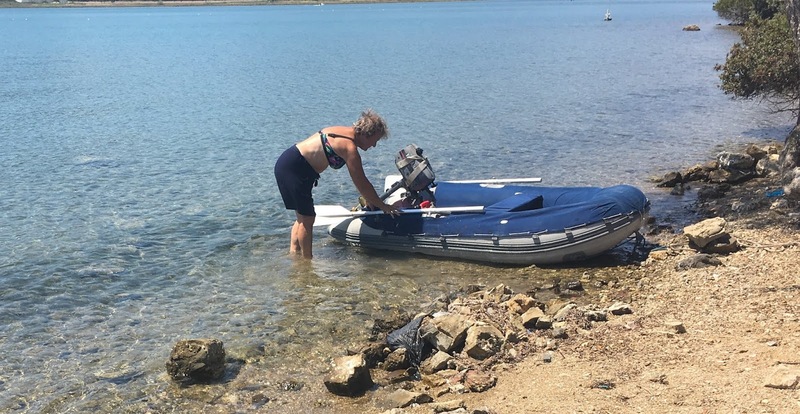 In order to send my drone up and safely retrieve it again I went ashore and pulled the dinghy up on the beach. The heat in the sun there was almost unbearable and there was nowhere to stand in any shade. With the remote control almost burning my hands I wondered if it would work OK. When it had flown the over 400 meters to the wreck, I filmed for a minute before activating the Return to Home button. It disappeared from sight! I was convinced I would never see it again when there it was, suddenly hovering over my head. I got it down with an immense sigh of relief and headed back to Aquarella. 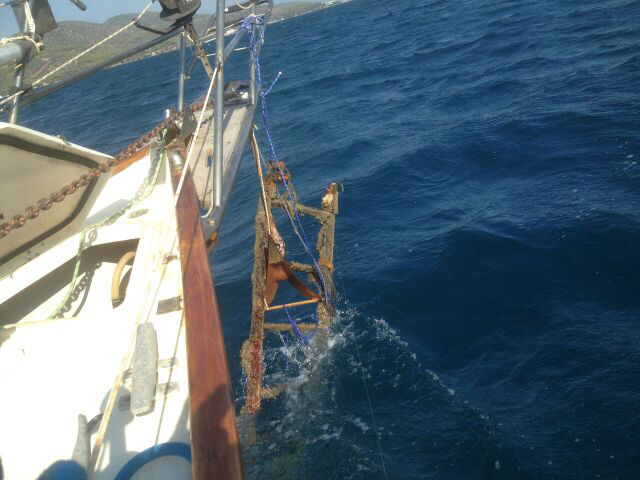 While the going was good I took the anchor up and motor sailed again back to Poros and my mooring buoy. There was quite a lot of wind when I got there and I missed the buoy the first time. I was determined to get it even if it might have taken 10 times. Round again, slow forward, starboard, port, reverse, missed again! Gritting my teeth , I tried once more and YES! got it on the third try. Mission succeeded! Olivia diving after a clothes peg. Screenshot from the video by Philip Elberling. My son Philip, daughter in law Henriette and granddaughter Olivia came to visit me on Aquarella last week. I had been contemplating about possible destinations to sail to and decided on a few places nearby that I had seen for the first time last year. The first short voyage was to the bay of Mandraki on the island of Hydra. With my experience from last year I knew this wasn’t going to be easy. But with planning, only a little wind and daylight this time I was optimistic. There were a lot of anchored boats with lines criss crossing ashore when we arrived and more were coming in. Henriette manned the remote control for the anchor windlass, I was at the wheel and Philip was to use the dinghy as tugboat. Knowing my long keeled boat is nigh on impossible to steer in reverse I thought this was the best strategy. Last time it took me 9 attempts before I succeeded getting my boat in place between the others. Most other boats have either twin engines or bow thrusters and short keels which makes maneuverability simple but not for 42 year old Aquarella. This time though I made it on the fifth attempt. 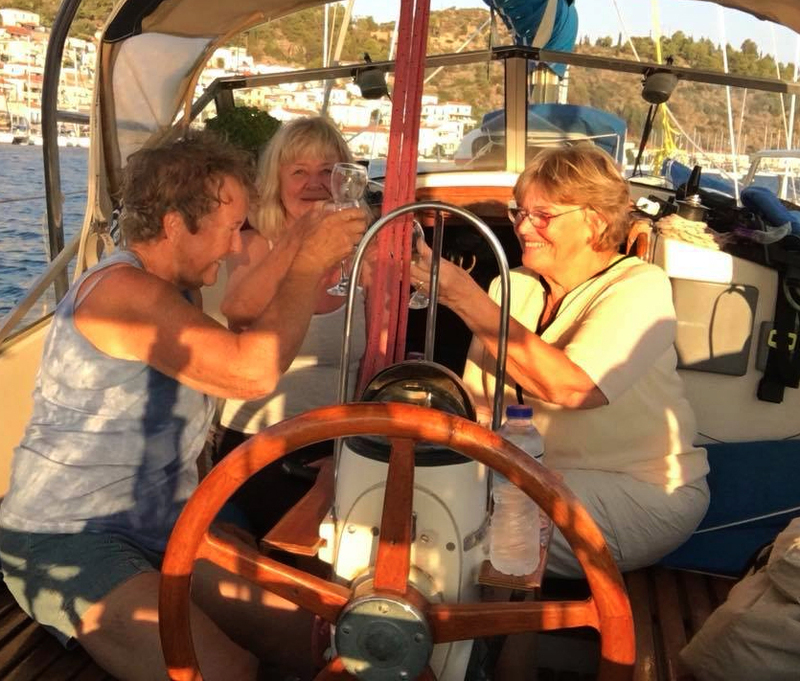 Henriette let all 80 meters of chain out and Philip pushed the side of the boat with the dinghy at all the effort the little old 2 hp Yanmar outboard engine could manage. With my finger nails I hung on to a big catamaran on one side while Philip took lines ashore and tied them to rocks. After pulling 10 meters of chain back we were then perfectly in place. 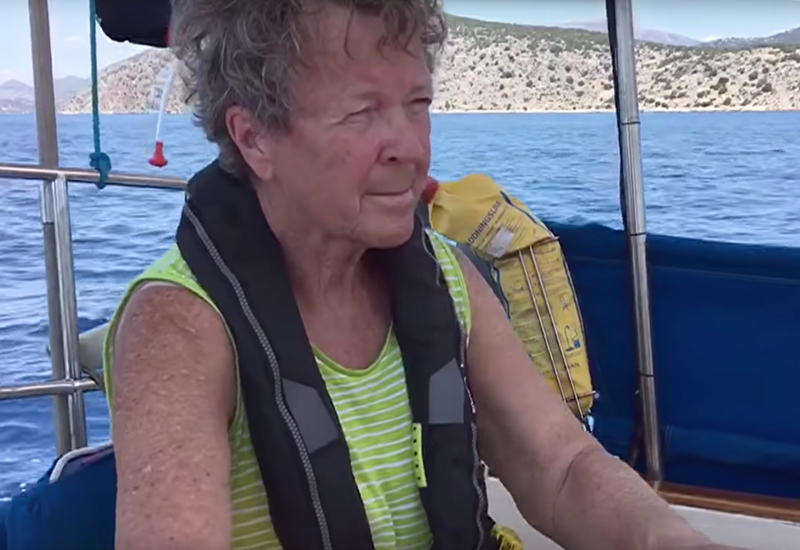 We left the boat there to take the beautiful walk along the hilly coastal road to Hydra town to eat dinner. The only traffic was one of the locals trotting along on a donkey. After dark we returned by watertaxi which took about 3 minutes and cost 20€. 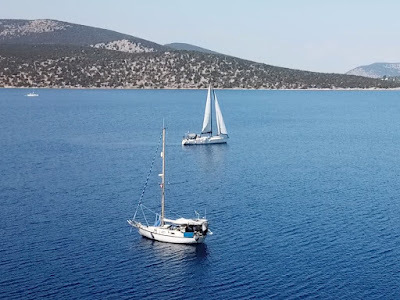 The next day we sailed to the uninhabited island of Dokos and anchored in the bay. It was a beautiful place and a magnificent sunset there. 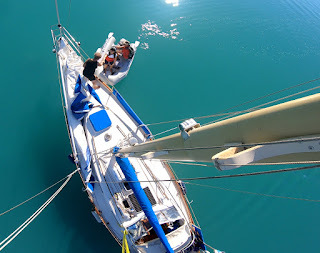 In the morning Philip and I took the dinghy ashore to send my drone up from the beach. I managed to fly very near to the boat for the first time but was nervous when I lost eye contact with it. I took care of the remote control while Philip kept an eye on the monitor until a warning popped up stating high wind velocity. Then I activated the go-to-home button and the drone became visible again and returned to land at our feet. Then I realized I hadn’t activated the record button! I couldn't see the drone anymore but it could certainly see the boat. I will post the final result when I have edited the film but so far it looks promising. On our way motorsailing to Ermioni,which was our next destination, the dreaded sound of the engine revs going down told me there was something caught in the propeller. 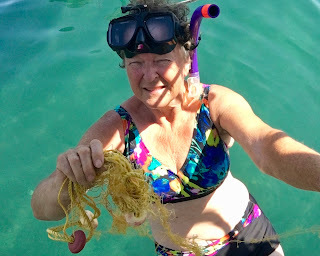 On arrival I snorkeled to take a look and found a fishing net firmly twined around. All four of us were then in action trying to free the propeller. Philip worked with a fishing knife while 12 year old Olivia, who is amazing at holding her breath and diving, pulled the lines out and tied them around a boat hook that Henriette was holding in the dinghy. I pulled and unravelled all I could get hold of. Finally, with great relief we succeeded and it was high fives and drinks all round. 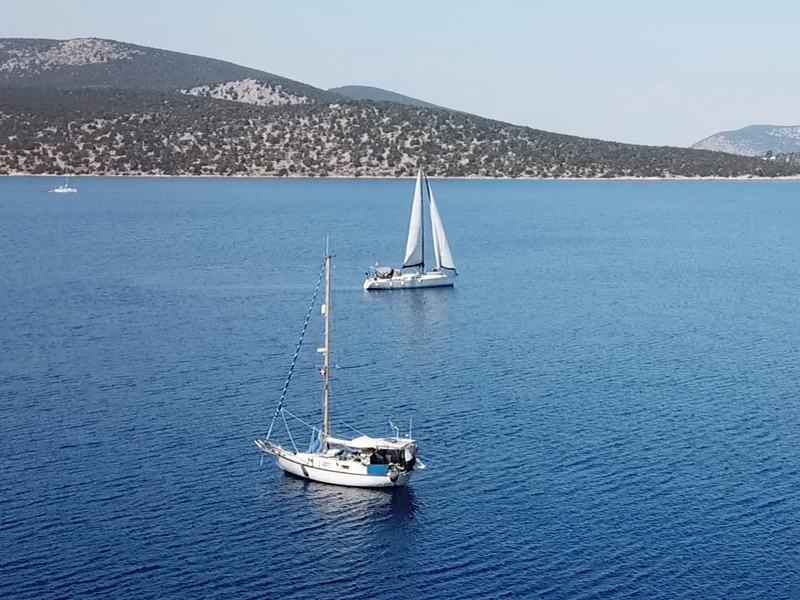 For the last destination and overnight stay we chose Skillion, a very small bay behind a tiny island on the way back to Poros. This bay has the clearest, most turquoise water I have ever seen. We all enjoyed bathing, swimming and diving here and my underwater gopro camera was in constant use. Aquarella as seen by the underwater audience. Screen shot from the video filmed by promising marine photographer, 12 yr old Olivia Elberling.